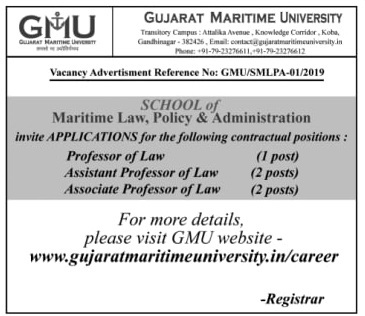 Gujarat Maritime University (GMU) has published an Advertisement for below mentioned Posts 2019. Other details like age limit, educational qualification, selection process, application fee and how to apply are given below. Application Fees: Application fees for each Post: ₹ 1000 for candidates from unreserved category and ₹ 700 for candidates from Scheduled Caste/Scheduled Tribe/Differently-abled (Physically and visually differently-abled) categories. Fees shall be paid either in cash at the University or through Demand Draft drawn in favor of Gujarat National Law University payable at Ahmedabad. No other mode of fees payment shall be accepted. Application form without the requisite application fees shall be summarily rejected. Duly filled in application form with the relevant supporting documents shall be sent to “The Registrar, Gujarat Maritime University, Transitory campus at Attalika Avenue, Knowledge Corridor, Koba-Gandhinagar, Gujarat 382426, India”.